This signpost is pointing the wrong way, the Kuridala road is 90 degrees clockwise from the direction indicated. I missed the turnoff first time as the sign was partially obscured from my view. But the person who gave me the directions said “you can’t miss the chimneys”. He was right, the huge chimneys were easy to spot and though wrong I knew that last turnoff was probably the way there. Kuridala was a mining (copper, silver and gold) town which briefly flowered in the early 20th century but is now completely abandoned. The chimneys of the smelter still dominate the remote landscape about 65km south of Cloncurry, in north west Queensland. 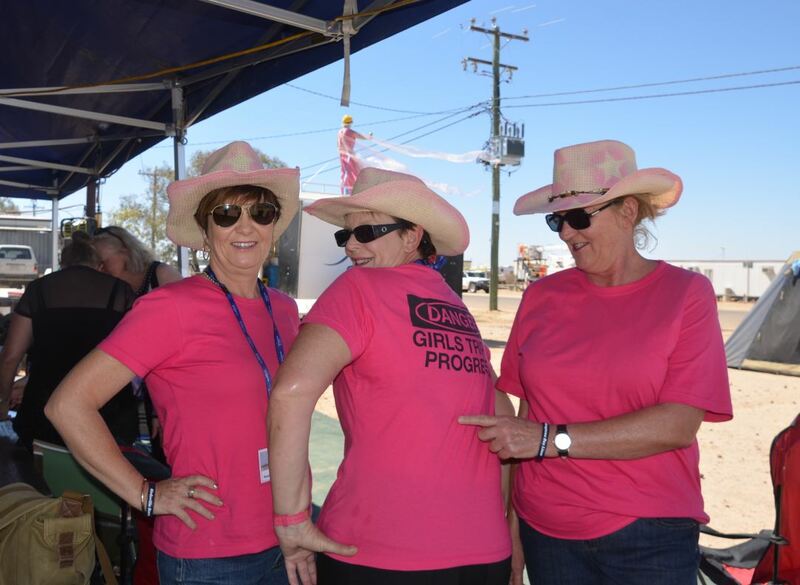 I was in Cloncurry the day before for the mayor’s lunch to celebrate the town’s 150th birthday. 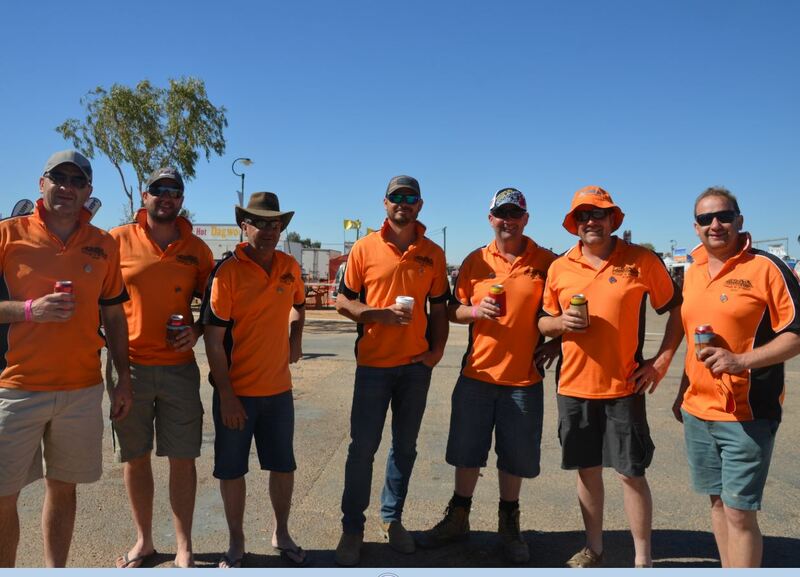 Copper mining is a crucial part of the Cloncurry story and Kuridala played its part, continually coming up in mentions in speeches at the lunch. At the lunch I was seated next to a local cop. He told me that on his days off he enjoyed fossicking for minerals, especially at Kuridala. It was the third or fourth mention of the town I’d heard on the day and an idea started to gel. I had to drive from Cloncurry to Dajarra the following day for a rodeo and I asked the cop how far Kuridala was from the Cloncurry-Dajarra Rd. About 40km, he said, and told me about the chimneys. I was sold. Care needs to be taken when fossicking due to unmarked open mine shafts. Copper was discovered at Kuridala in 1884 (not long after Ernest Henry found the first copper at Cloncurry). Kuridala is an Aboriginal word meaning eagle hawk, though experts are unsure which language it comes from. The area had several name changes in quick succession in the late 19th and early 20th century. It was first known as Gulatten, then Hampden (the name of the copper company on the field). Probably because of the influx of German miners it was renamed to Friezland but the First World War was not a good time for German names and was renamed Kuridala in October 1916. No one now lives at Kuridala but many people died there. There are over 360 graves in Kuridala cemetery. At peak the town supported six hotels, five stores, four billiard saloons, three dance halls and a cinema, two ice works and one aerated waters factory. But it was a brief peak. The two big iron chimneys that dominate the landscape are part of a considerable amount of remains of the smelter-works including a blast furnace and concrete engine mounts. The Hampden Smelter opened in 1911 and over three years treated 85,266 tons of ore with an initial dividend of £140,000 in 1913. The smelter made money servicing the Empire war machine from 1914-1918, despite marketing, transport and labour difficulties. The Hampden Cloncurry Company declared big dividends: £40,000 in 1915, £140,000 in 1916, £52,500 in 1917 and £35,000 in 1918 for almost half a million pounds of revenue. The smelters treated over a quarter of a million tons of ore in the war, averaging 70,000 tons annually. The company built light railways to its Wee MacGregor and Trekelano mines and installed a concentration plant in 1917. A year later they erected an Edwards furnace to pre-roast fine sulphide concentrates from the mill before smelting. At the end of the war the British government dropped copper price controls which put the Hampden Cloncurry Company in difficulties. They postponed smelting until September 1919 and they lost heavily during the next season relying on ores from Trekelano mine. The smelter treated 69,598 tons of ore in 1920, but they had to halt all operations after the Commonwealth Bank withdrew funds on copper awaiting export. Like other Queensland companies struggling after the war, they turned to the Theodore Labor government for assistance but got nothing. Negotiations for amalgamation occurred in 1925 but failed, and in 1926 Hampden Cloncurry offered its assets for sale by tender. Mount Elliott acquired them all except for the Trekelano mine. The company was de-listed in 1928. The population of Kuridala peaked at 2000 by 1920, but reduced to 800 by 1924. A year earlier, a new field at Mount Isa had opened up and the bakehouse, the hospital, courthouse, one of the ice works and picture theatre moved there followed by Boyds’ Hampden Hotel (renamed the Argent) in 1924. Other buildings including the police residence and Clerk of Petty Sessions house were moved to Cloncurry. By 1928 all bar one family had gone. In nine years of smelting Hampden Cloncurry had been one of Australia’s largest mining companies producing 50,800 tons of copper, 21,000 ounces of gold and 381,000 ounces of silver. It helped create the metal fabricating company, Metal Manufacturers Limited which established a major works at Port Kembla on the back of their Kuridala success. The Tunny family lived on at Kuridala fossicking the Hampden and Consol mines from 1932 until 1969. A post office operated until 1975 and the last inhabitant, Lizzy Belch, moved into Cloncurry about 1982. Today it is farmland and cattle wander through the works in search of feed. These two water tanks reminded me of the smoke stacks of the Titanic, an apt metaphor for Kuridala and from a similar vintage. 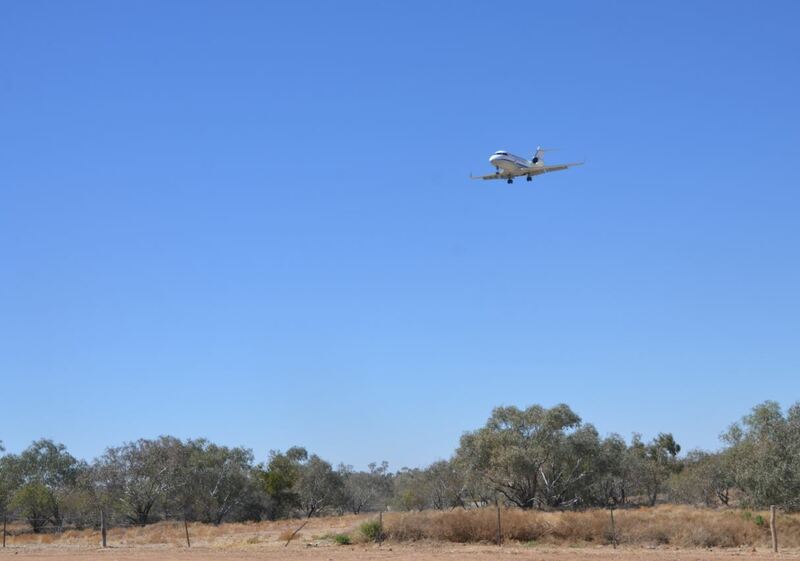 Driving in from Mount Isa, the first thing you notice as you arrive into Birdsville is the planes. 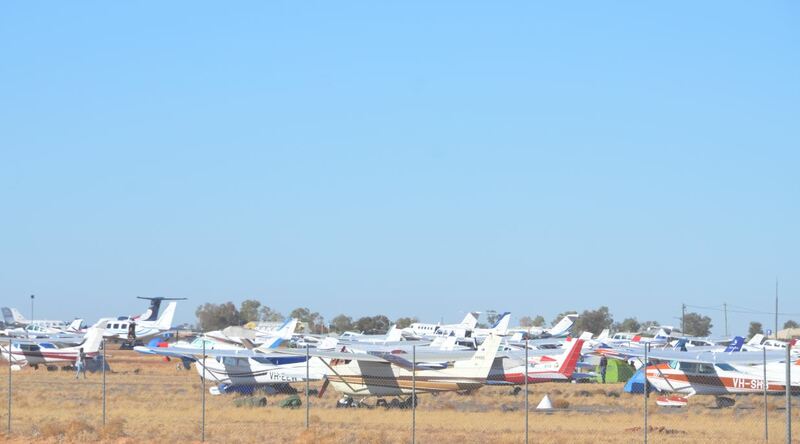 There must have been hundreds parked at the airport of every size and dimension and from all parts of Australia. The second noticeable thing is the steam rising outside the airport. 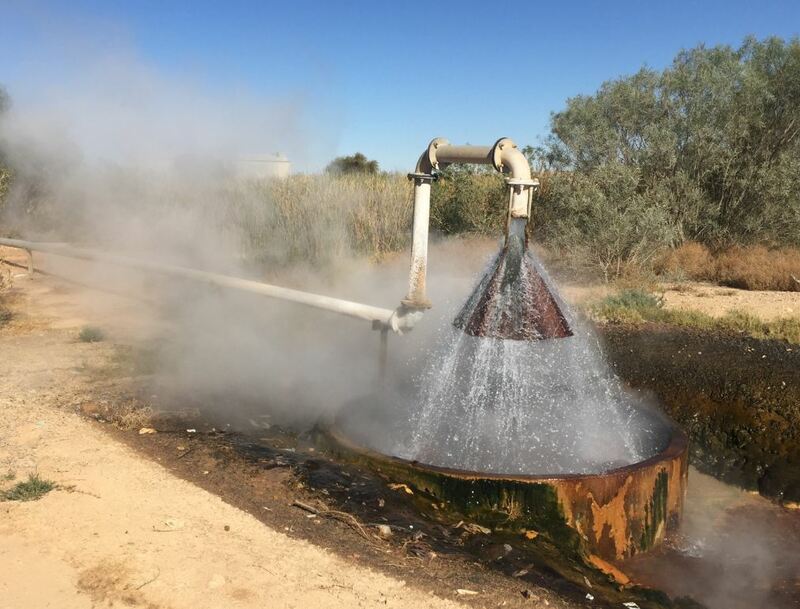 It is from the artesian bore piping water up from the Great Artesian Basin. The bore was drilled in 1961 and has a water temperature of just below boiling point. A series of cooling tubes and a parallel plate heat exchanger brings the temperature down. Situated on the eastern fringe of the Simpson Desert, the area around Birdsville was the home of the Wangkangurru-Yarluyandi people. The first Europeans came in 1844 when SA Survey-General and explorer Charles Sturt led expeditions to the area. Burke and Wills Camp 76 was also in the region on their return trek in 1860-1. The township of Birdsville grew out of the colonial need to create a customs post between South Australia and Queensland. Before motorised transport Afghan cameleers brought supplies up the Birdsville Track. But today was all about horses. 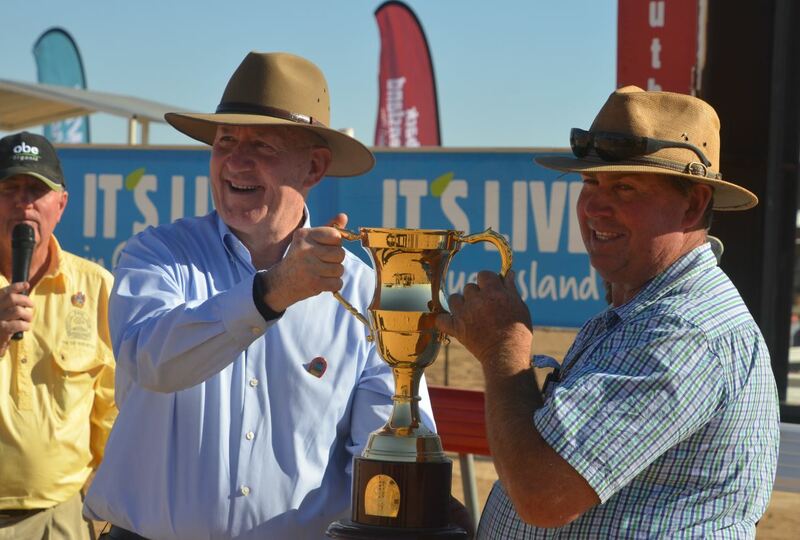 The 135th running of the Birdsville Cup. They came from all parts with the town of 200 swelling to 6500 for the weekend. I have been to Birdsville many times before (most recently to the 2017 Big Red Bash) but this was my first time here for the races. The main street was set up with market and food stalls. 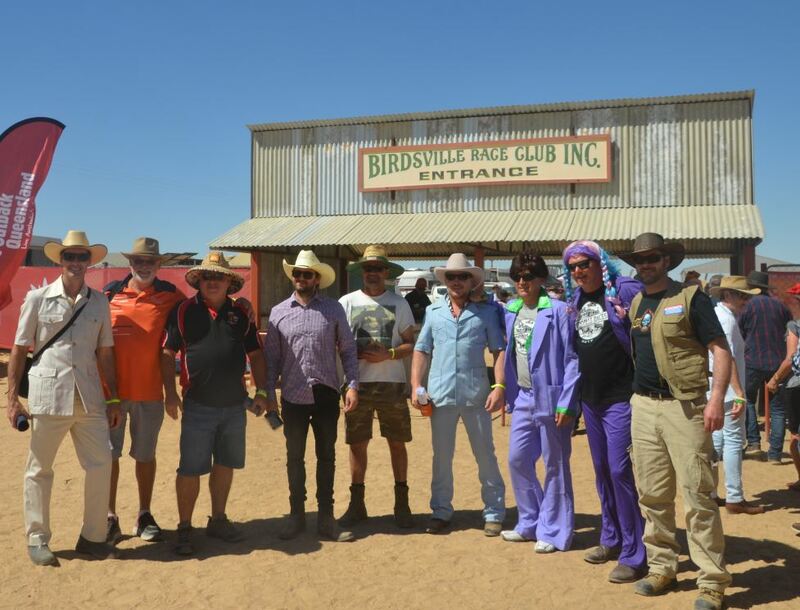 Before the races the place to meet was the Birdsville Hotel. They came dressed in all kinds of costumes. 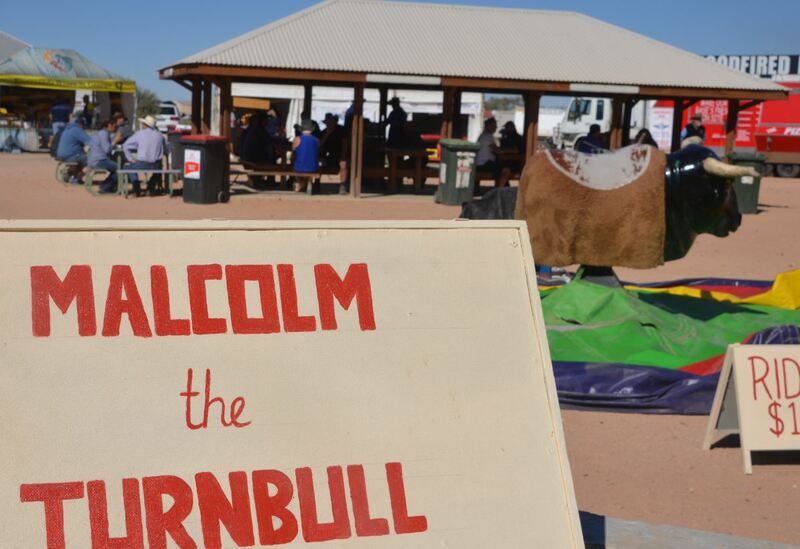 Prime Minister Malcolm Turnbull has an association with Birdsville having visited twice since 2015 to check out the town’s internet and mobile capability. He wasn’t there today but a mechanical bull named in his honour was there. 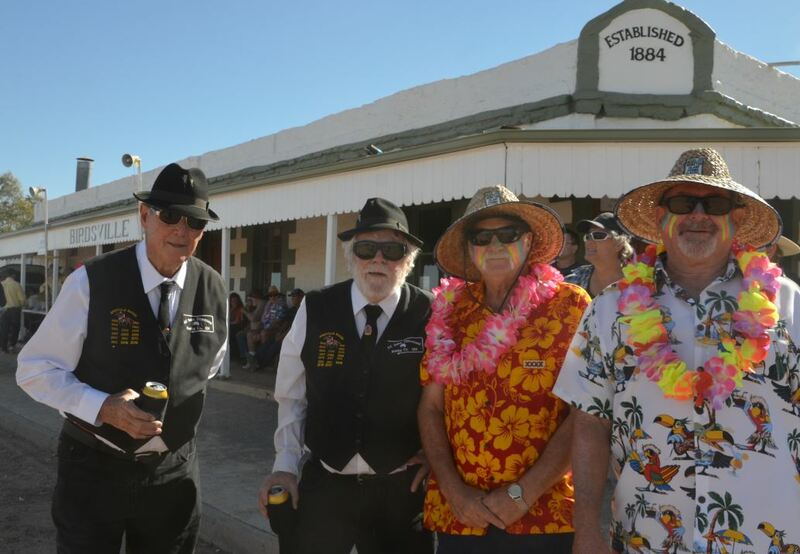 The pub was the site of the Calcutta for the Birdsville Cup. A Calcutta is an open auction where each horse goes to the highest bidder. The practice originated with the Colonial British (of course) in Calcutta, India. I’m always on the lookout for colourful costumes or groups so not surprisingly my eye was drawn to these guys. I asked them where they were from. “Orange,” they replied. “Of course,” I said and they laughed. “You serious?” I said, doubting them. But indeed, they came from Orange, NSW. 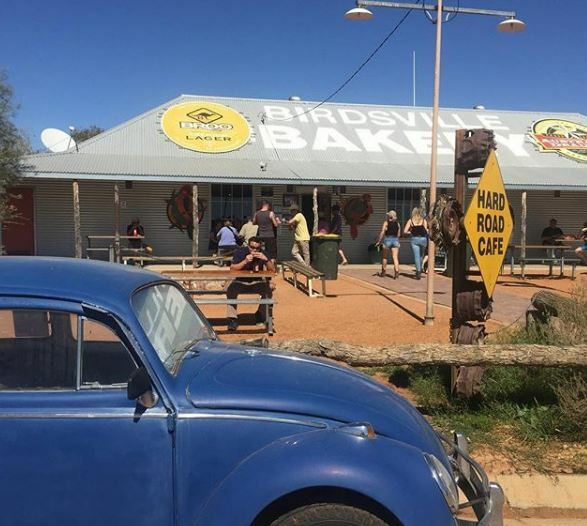 The Birdsville Bakery is a little bit away from the action across the town oval but always worth a visit for its camel pies. Permanently parked out the front is Onslo the VW Beetle. It was owned by author and journalist Kelly Theobald, who was killed in a car crash on the Birdsville Track in 2015, aged just 27. As I headed back across the oval, a plane came in overhead with distinctive RAAF markings. I knew exactly who it was. Earlier I had bumped into the Diamantina Mayor Geoff Morton but he was in a rush and couldn’t stop to talk to me. When I picked up my media pass I was told why, the Governor General of Australia Peter Cosgrove was expected in town at 11am. And here a minute or two after 11 was his plane. 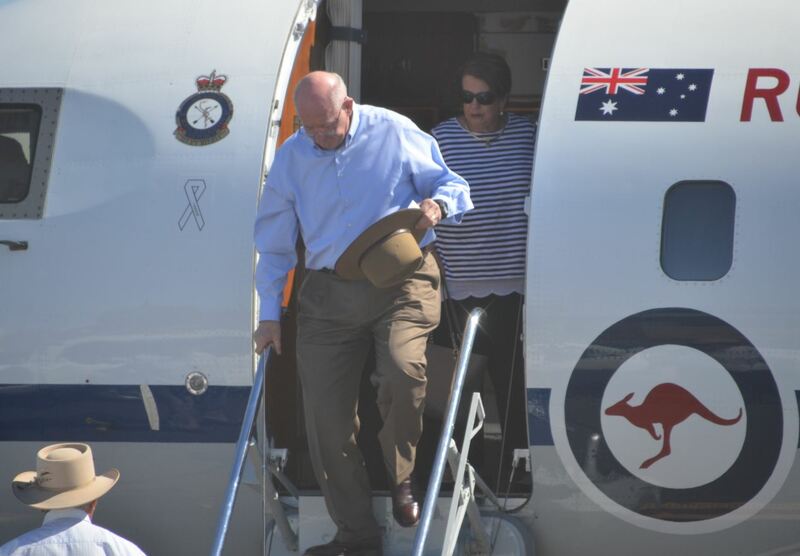 I walked back to the airport, conveniently located in the middle of town, opposite the pub and saw Cosgrove come off the plane with his wife to be greeted by Mayor Morton. They were quickly whisked away on a tour of town. That tour probably included a pub visit at some stage. 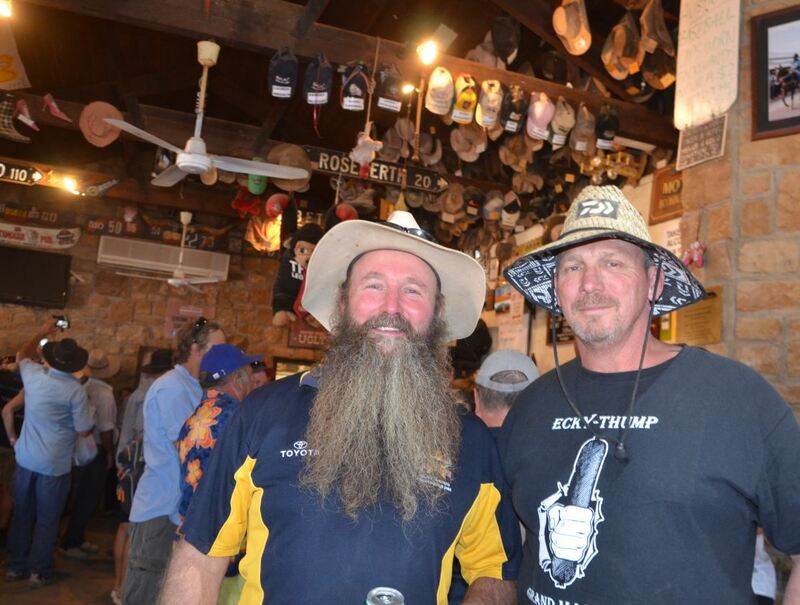 William Blair built the Birdsville Hotel in 1884 and its weathered sandstone walls have been there almost as long as the races. The hotel is heritage-listed as one of three surviving masonry buildings in Birdsville and is a rare surviving late 19th century outback hotel. One of the other two (along with the courthouse) is the ruins of the 1883-vintage Royal Hotel. 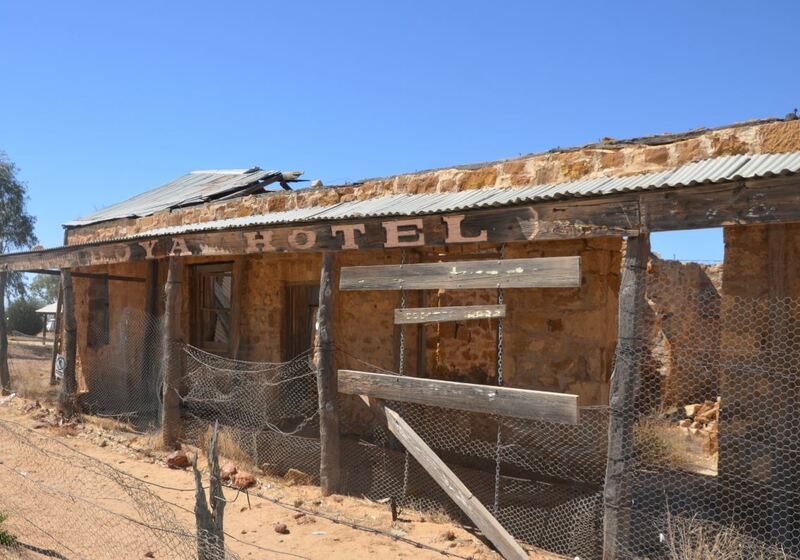 Though only a year older than the Birdsville Hotel, it has suffered more from the ravages of time. From 1923 to 1937, the building was leased by Rev John Flynn’s Presbyterian Australian Inland Mission as its first bush nursing home and Alfred Traeger installed one of his first bush pedal radio stations there. Afterwards it was used as a residence, then abandoned before it partially collapsed. 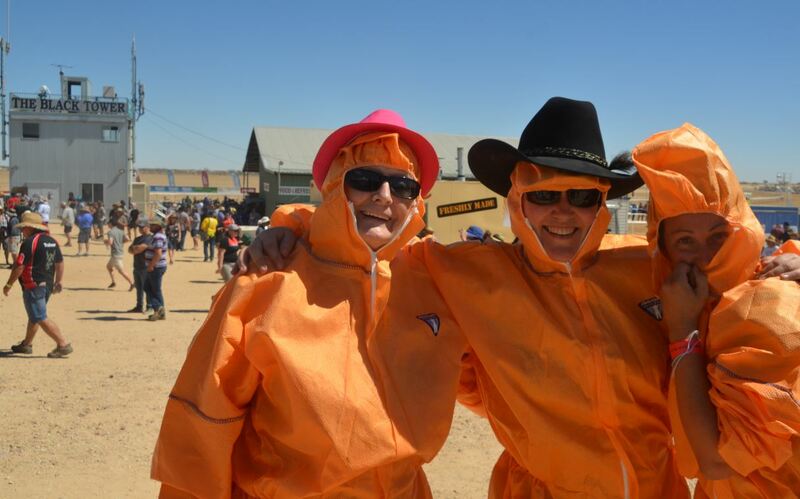 Continuing to find colourful groups, these three ladies were happy to have their photo taken, “Girls Trip in Progress”. 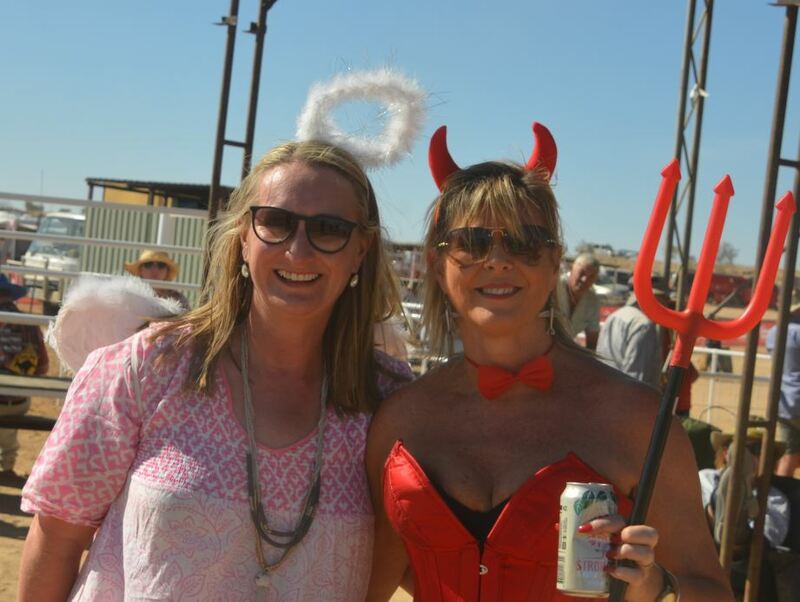 Someone later told me the Birdsville Races was a “schoolies for the over 50s” and the evidence was everywhere. 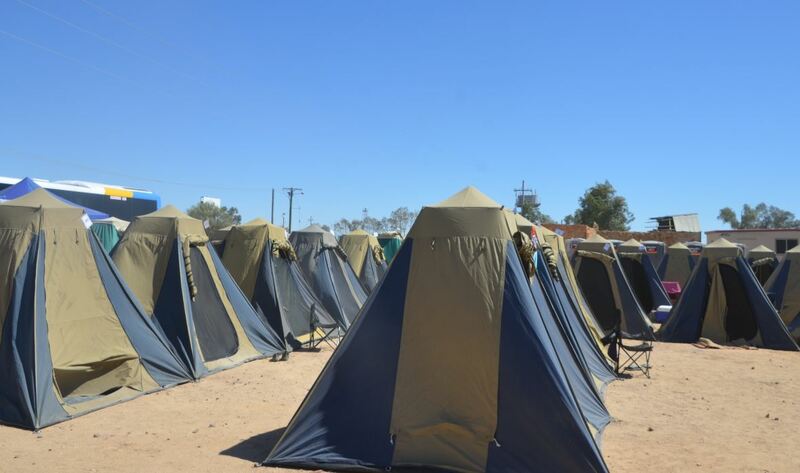 Like all schoolies they needed holiday accommodation and tent cities were set up all over town. Having completed my town tour, it was time to head to the races. 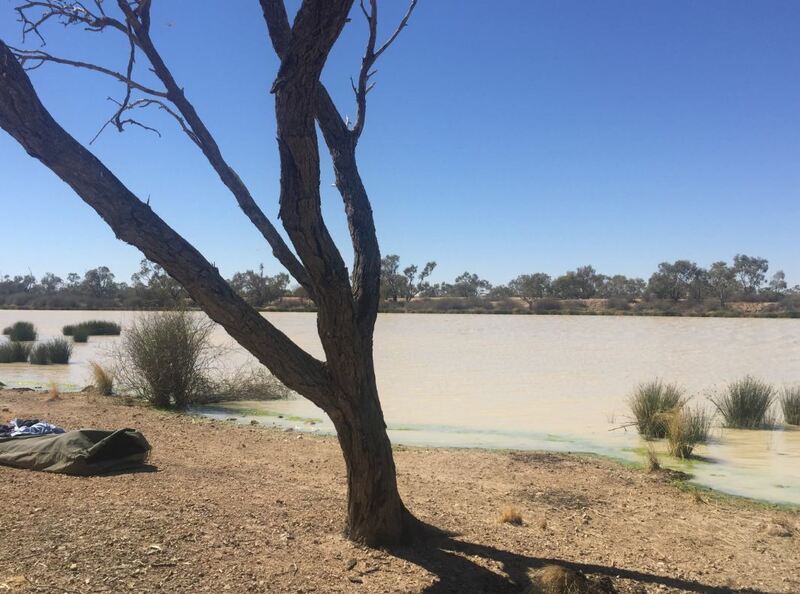 The racecourse is a few kilometres south of the town across the Diamantina River, which is part of the endorheic Lake Eyre Basin. We’ve had hardly any rain for six months in western Queensland so I was surprised to see how much permanent water was still in the river. The river attracts the bird life and explains how the town got its name. The entrance to the track was THE place to get your photo taken, or in my case, to take photos. 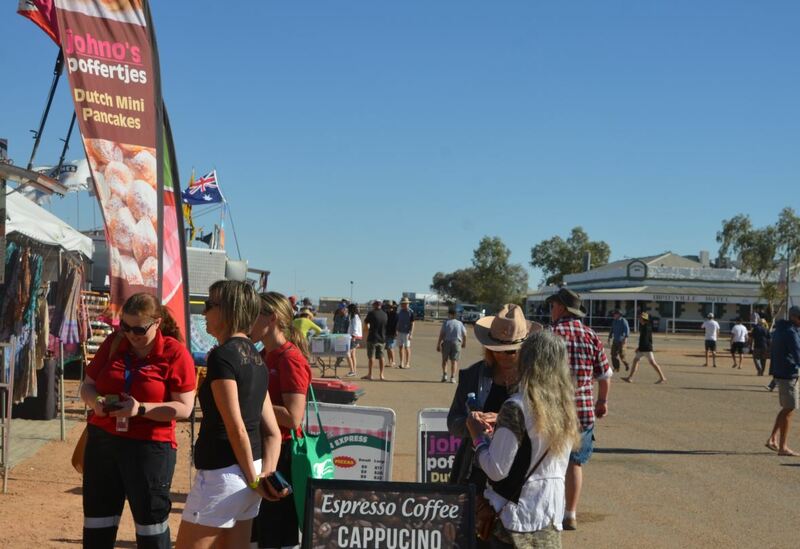 The set up was impressive for a bush race meeting and the 6500 punters were catered for with ease. Needless to say it was full of colourfully-dressed characters from all over Australia like these “Dust Angels” from Brisbane. Behind them is the “Black Tower”, the communications and media centre at the meet. The Black Tower is, in typical inverted Aussie bush style, white. 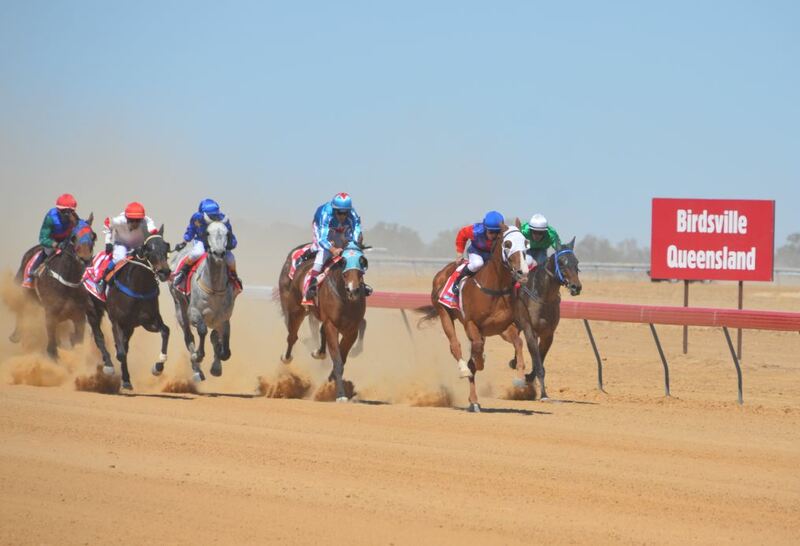 There was actual horse racing at the Birdsville Races. Two days of it on Friday and Saturday. I got there for the Saturday and this is Race 1 with Mount Isa jockey Dan Ballard storming home to win on Nuncius. As well as the novelty outfits there were many people dressed up in proper attire. 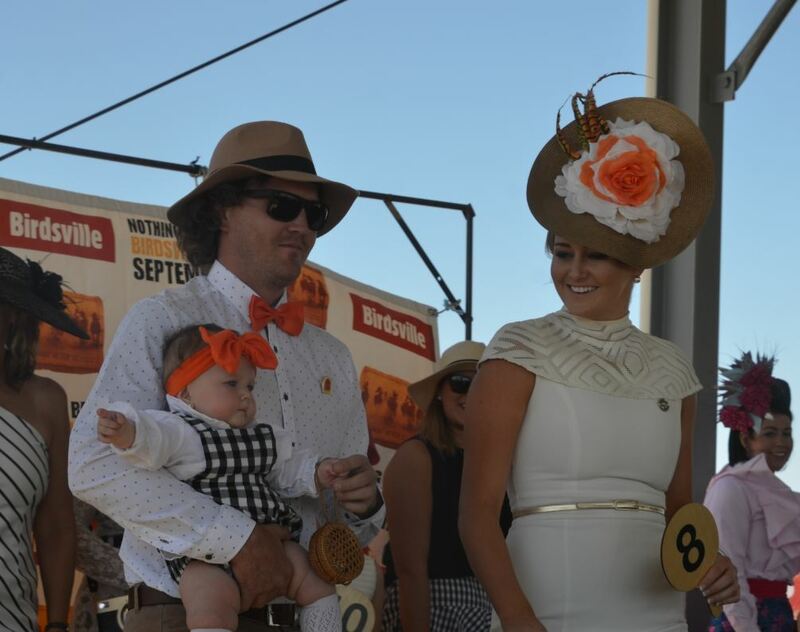 The fashions on the field attracted big prizes and were hotly contested by women, men, couples and even families. 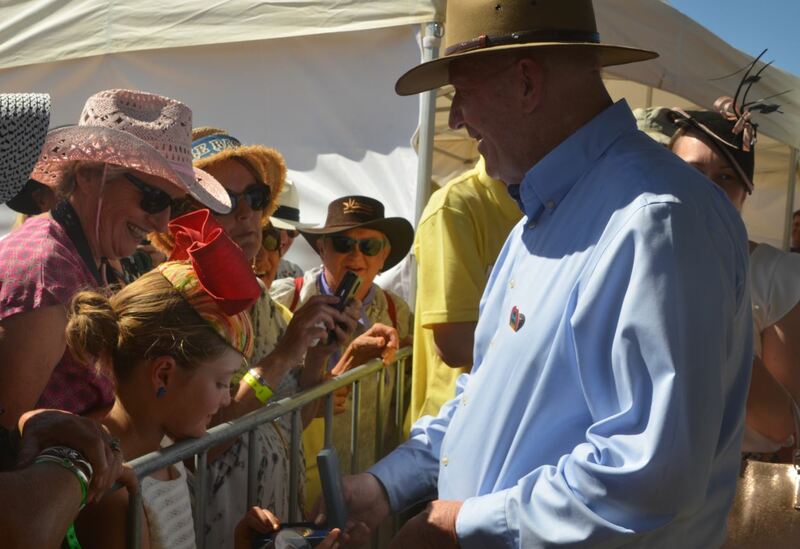 The Governor-General came along to watch the fashions and as he did so, he handed out a medal to a young girl. I asked him what that was about. He said it was the Governor General’s medal and it was a random decision to give it to that girl. He had never met her before but must have liked her smile. 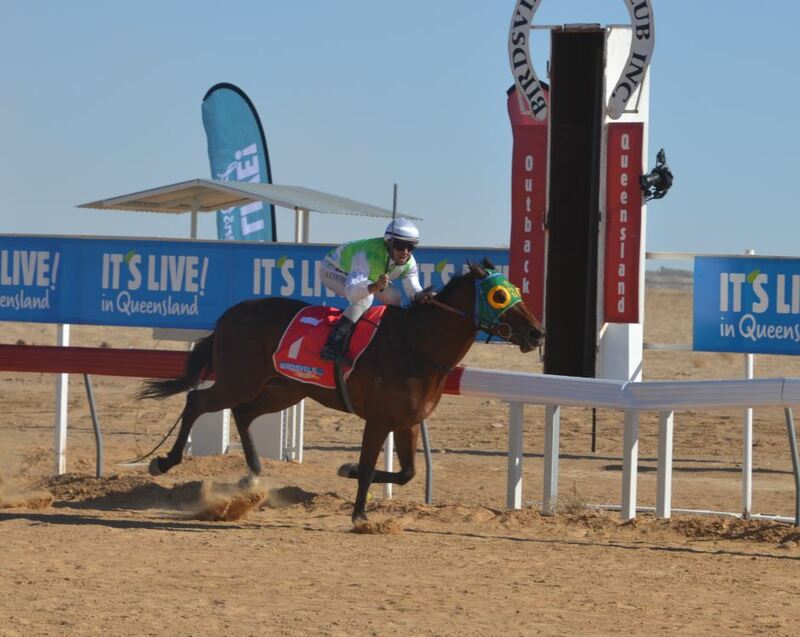 After a big day at the track, it was time for the 135th running of the Birdsville Cup. Victory went to Roma horse Fast Fella ridden by Rockhampton jockey Adrian Coome. The GG was on hand to present the gleaming gold trophy to winning Roma trainer Craig Smith. 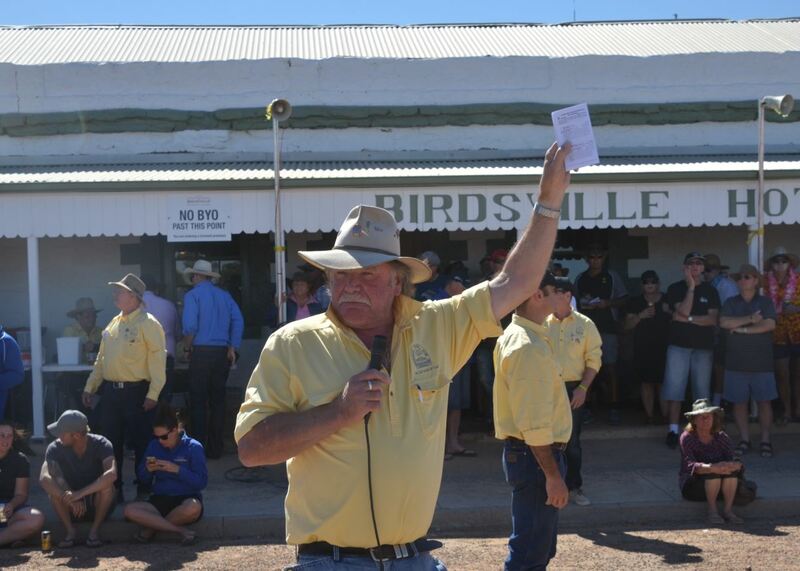 While they celebrated it was time for me to bid adieu to Birdsville for another year.